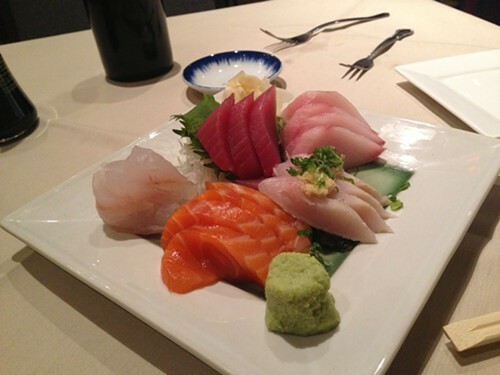 Sushi Makio, a new Japanese restaurant on Morton Boulevard in Kingston invited Hudson Valley Good Stuff to taste a traditional Omakase style 10 course dinner last week. The restaurant has been open since December 3rd. The chef owner Makio Idesako, is a sushi master chef who has been creating delicious sushi for 40 years so I knew I was going to taste something very unique. (Hudson Valley sushi lovers may know him from his previous work at the Amici Sushi Kitchen at Depuy Canal in High Falls and Bull and Buddha in Poughkeepsie. My husband Tom and I ended up going to Sushi Makio on our anniversary, which fell on a Tuesday this year. We braved the Polar Vortex temps, and arrived at Sushi Makio at 6pm. Chef Makio greeted us from behind the sushi bar, prepared to cook an Omakase style dinner for us. I have never had an Omakase dinner. This was a 10-course dinner, but it can have even more courses. Each plate is impeccably presented. Though Makio makes it look easy, there is a method to it. The dishes, all selected by Chef Makio, were proportioned perfectly. I’m an adventurous diner so I enjoyed not knowing what was coming next. First came a small dish of cucumber, tako, red clam, shrimp (sunumono). The second dish was baby octopus and kinpira gobo. (I have calamari know and then, but I’m not used to seeing the whole octopus). I looked over at my husband who was chewing it cautiously. I dug in. It was indeed very tender and the salad was very flavorful. What could be next? Our server presented us with an oversized bowl of steamed mussels in a saki and teriyaki broth. 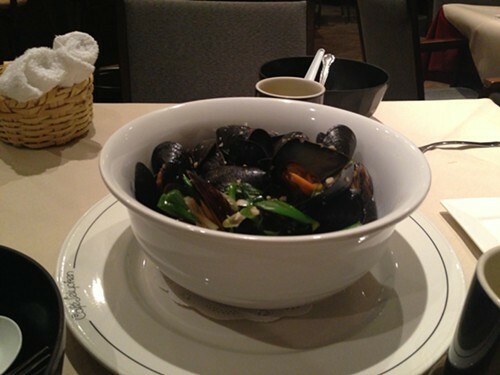 The mussels were small and very tender, and very soft. I took the server’s suggestion and made sure I tasted the broth by itself. I did like the sweet and salty combo of the saki and teriyaki. We ate at a slow and steady pace, watching Chef Makio behind the sushi bar, busy with his hands, but we couldn’t tell what was next. 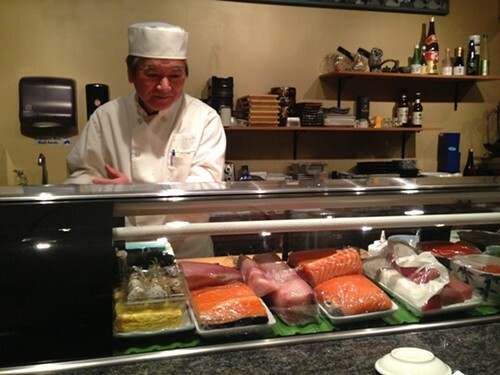 (Depending on the night, small parties can eat at the sushi bar for an Omakase dinner (price starts at $50 per person). We chose a table as it was a Tuesday night, and we had the small restaurant to ourselves while we were there. After the mussels, came the sashimi assortment: tuna, yellowtail, salmon, Spanish mackerel, fluke arrived with soy sauce. All the fish was very fresh, and I loved the salmon the best. Tom liked the yellowtail. After the sashimi, came a small bowl of cooked Japanese vegetables, then grilled black cod with miso. 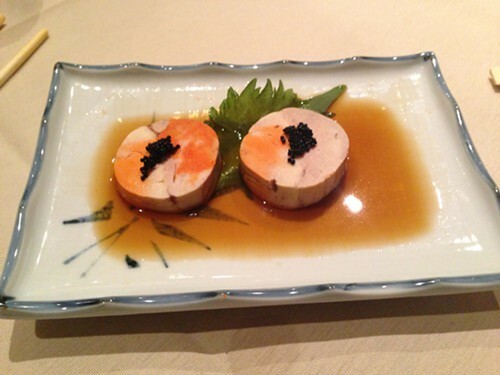 After that, our server brought out a plate of beautiful monkfish liver pate topped with black caviar (ankino). 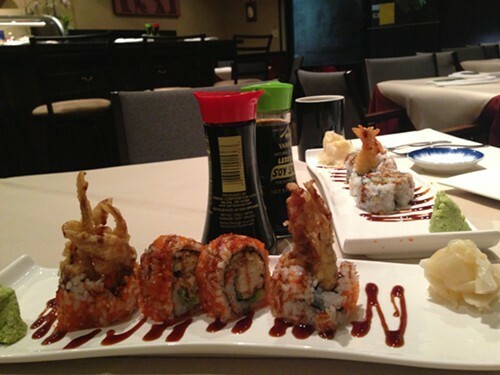 I couldn’t resist posting the Ebi tempura roll and softshell tempura roll (spider roll) to Facebook mid-meal. It was perfection! After devouring the tempura rolls, there was still more. We were presented with a platter of beautiful sushi (Nigiri) Tuna, Yellowtail, Salmon, fluke, anago (sea eel). After eating the second to last dish, we were contently full, and we were very happy at the site of the mochi Japanese ice cream (red bean, green tea, and mango flavored) wrapped in soft rice dough. The Omakase dinner must be reserved in advance. Though I didn’t order from the menu there are a zillion tempting options, and next time I go I’d love to try any of the Sushi Makio Must Haves: dragon roll, million dollar roll, out of control roll, lobster fiesta roll, and rich and famous roll. Gunham maki selections, sushi and sashimi, and kitchen entrees such as tuna, salmon, and shrimp teriyaki sauce, and two noodle dishes. 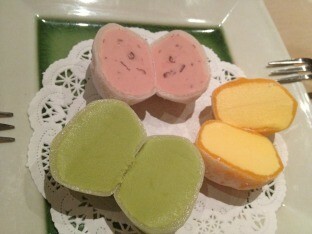 I would definitely recommend Sushi Makio if you love sushi and other Japanese specialties. They also have a selection of Japanese wines, sake, and beer. Chef Makio can tailor the Omakase dinner to suit individual tastes as well. We told Chef Makio and his wife Taeko that it was our 13th wedding anniversary, and they told us they’ve been married for 40 years. Well, we can’t compete with that! Lastly, Randy and Tim are excellent servers! Read more of Vanessa Ahern's culinary adventures at blog Hudson Valley Good Stuff, a blog she started in 2009, follow HVGS on Facebook, and sign up for her newsletter.